The story: Sunrise Elementary School has just hired a new librarian. She is...well...not what they expected. She doesn't allow the children to touch the books. She gets in arguments with the principal and the other teachers. And she's also a dragon. Can one brave little girl teach Ms. Lotta Scales that books are for enjoying and discover a secret in the process? Mama opines: I threw this in our library pile this week in the midst of all the Berenstein Bear and dinosaur books. This is a humorous tale with a lot of silly puns thrown in for the parents. Case in point: "Miss Scales thought that the way some books spread an unfounded fear of dragons was positively inflammatory." The illustrations are smart and colorful and there are lots of jokes hidden within the pictures if you are looking out for them. 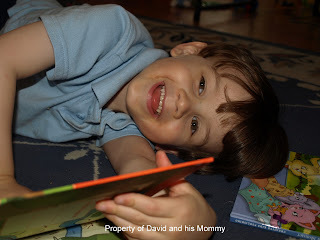 Thoughts from David: I like it because the dragon keeps getting the books and she does not let anyone take the books. Favorite part: When the dragon is actually a person!